We’re now over a month into 2019. How are your New Year’s resolutions coming along? If you made a promise to yourself to update your home in 2019, there are several ways to do just that. Adding natural stone and tile into your home, whether in the foyer, kitchen, bath or any other room, is a surefire way to add opulence, elegance, and sophistication to your home. Keep reading for 4 ways to spruce up your home in 2019. Your kitchen can be the biggest showcase in your home. 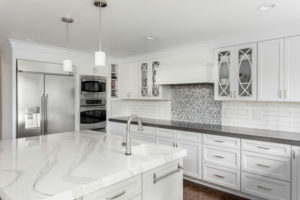 However, if you have worn out countertops or, gasp, Formica or other outdated counter tops, you likely aren’t making the statement you’d like to. Thankfully, adding marble, granite, or other natural stone countertops to your kitchen can completely elevate the entire space. If you already have natural stone countertops in your kitchen, that doesn’t mean that they’re pristine looking. In fact, certain natural stone surfaces wear out or etch over time and can leave them looking far from dazzling. Thankfully, Advanced Stone & Tile Restorations offers natural stone restoration services to get your surfaces looking like new again. Another way to elevate your home is by adding natural stone to your bathroom. A stunning shower or pristine marble floors in your bathroom will wow your guests and leave you feeling like royalty every morning when you step into the updated space. We all know how disgusting dirty grout can make a bathroom or kitchen look. Unfortunately, that built up gunk can be hard to remove. At Advanced Stone & Tile Restorations, we offer grout cleaning and recoloring services to get your bathroom looking as good as new again. Advanced Stone & Tile Restorations Can Help Elevate Your Home In 2019! If you are looking to elevate your home in 2019, Advanced Stone & Tile Restorations can help you do just that. Not only can we walk you through every step of the natural stone fabrication process, but we can also maintain and care for the natural stone that is already in your home. We offer grout cleaning and coloring services, color enhancement for natural stone, and restoration of stone countertops and floors, sealing, and more services. With over years of experience and a vast portfolio of prominent clients, rest assured that Advanced Stone & Tile Restorations will get the job done right. To learn more about the services that Advanced Stone & Tile Restorations offers, visit us on the web at Advanced Stone & Tile Restorations. If you are ready to schedule services, please contact us today at (714) 917-5255! We look forward to making the natural stone in your home as beautiful as it was when first installed.